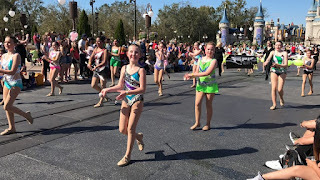 This is a continuation of a post that started telling of my trip with my ten-year-old daughter to Disneyworld and the Twirlmania baton competition in February 2018. Check out the first part here. Friday's logistics made visiting an actual amusement park just too challenging. We started out the day at the ESPN Wide World of Sports (EWWW) where Maggie successfully completed her audition to be a part of the mid-day and evening parades at the Magic Kingdom on Saturday. How exciting is that?!? The twirlers had received a YouTube link for training of the routine, and they practiced hard to be included in such a cool parade. After a couple hours of practicing and auditioning, we headed to Disney Springs again for some lunch and shopping. It was the perfect place to entertain ourselves for a bit since parking was free, and we had to be back at EWWW early that evening to start competition events. We had a lovely lunch at House of Blues, and got most of our souvenir shopping done at the many shops there. By mid-afternoon, we were back at the hotel to curl hair and do make-up for our first event ('our,' like I compete? LOL No. It's all her.). The first event is usually costume model, when the judges expect to see hair long and curly. Maggie's hair is straight, so we always put the effort into curling her hair. Her make-up is nothing fancy, just a little something to help accent her features for the judge. She looks so little! My view from the stands. Competition is truly a lot of hurry up and wait. We were at EWWW from 5:30pm or so til a little after 9pm, with all of her costume model and march events done. She still had solo twirling, and x-strut to do starting at 8am on Saturday, so we just got some Kentucky Fried Chicken for drive-thru on our way back to the hotel for the night. Saturday morning was early. Luckily all the twirling events just have the girls perform with a bun in their hair, so it's a lot easier for us than curling. She got her make-up and her costume on and we headed to EWWW. 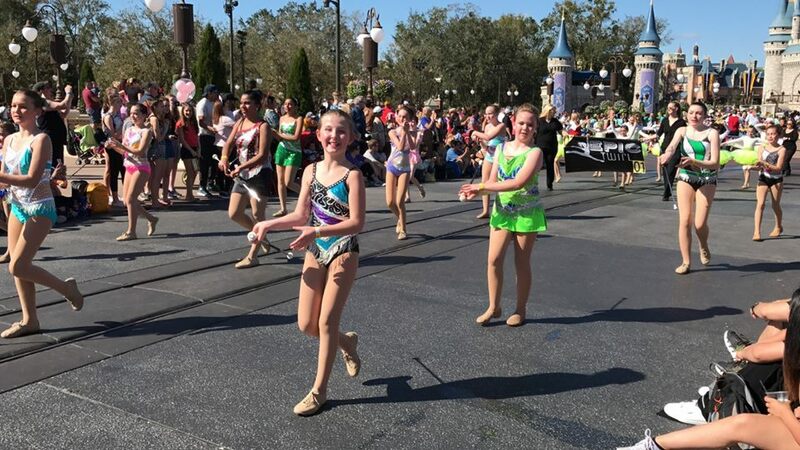 The competition wasn't the most exciting thing today - after morning events we were headed to the Magic Kingdom so she could be in the mid-day and evening parades! Getting anywhere in and around the parks always takes longer than you plan for, so we were nearly running to the meeting point at the Magic Kingdom to make our 1pm required arrival. And because the morning had been so busy too, Maggie had only had a banana and a handful of crackers to eat. So she was first in line when they were handing out water, but ready to twirl in the mid-day parade in 80-degree weather. She even got to be in the front row! Since the girls were scheduled for a few more run-throughs of practice, a couple other twirling parents and I had a chance to sit down and enjoy lunch (with a side of guilt) before finding great viewing points on the parade route. After the (very hot) parade, we had enough time to grab a snack for the girls before they had to be back and get ready for the evening parade. And here's where Maggie and I made our critical error (no, of course it isn't that bad). When we dropped the girls off, it was still definitely daylight, so we decided to stick with regular batons instead of glow batons (which we were ready with). But the parade started later than posted, so it was dark once they performed, and lighted batons would have been awesome. Oh well. They still did a great job. Because the parade started later than expected, we had less time afterward than expected, and wanted to at least see Hollywood Studios for a couple minutes. We had a Fast Pass to see Muppet Vision 3D, which was one of Maggie's top picks. We made it, but we really did have to run through Hollywood Studios to get there for the last show. Sunday we were expecting a much more relaxing sort of day. We were going to Epcot with another twirling family that was more familiar with the parks. We didn't have to be back to EWWW until around 7pm for awards night. Our first stop was Journey into Imagination. I absolutely love Figment, so this was a can't miss for me! After Journey, we headed over to Spaceship Earth. This one made Maggie a little nervous during the obvious climb (remember, she's not a big hill and roller coaster fan) until I pointed out that we had no actual lap belt. Nothing with just a bar across our legs would be moving too fast. And she was super excited to be inside the giant golf ball that could be seen from all over the property if you were watching for it. From Spaceship Earth, we headed to either lunch or Test Track. Test Track was another favorite. We paired off with another twirling family who had more experience at all the parks, so we were each able to design our own car with the advice of someone who had done it a bunch of times already. I tried to tell her that the fast parts of the ride were also very much like a roller coaster! 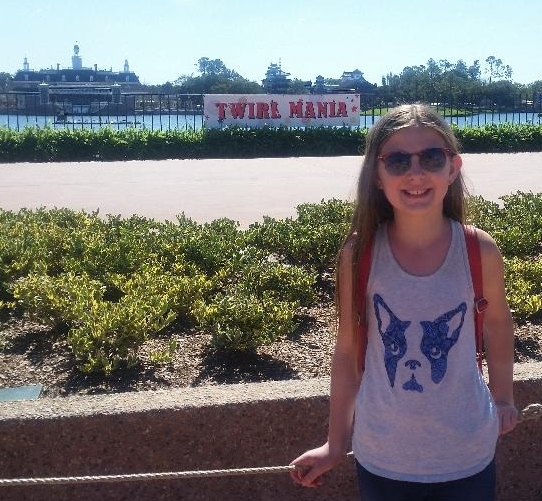 For lunch, we made our only trip to the world part of the park, and had some yummy food in China, as well as getting her picture with the Twirlmania sign on the other side of the water. Once we were done with Test Track, we attended Turtle Talk with Crush. Maggie was so excited to almost trip up Crush by asking about his wife. He had no prepared answer. It was fascinating to watch the animation attempt to answer questions with no advance notice. This is a great attraction to visit for any age! We found ourselves with just a few more minutes, and didn't want to walk too much further from the entrance of the park before we had to leave for the awards ceremony, so we went to the Living with the Land boat ride. This one also hasn't changed much in the decades since I've visited the park previously (although I'm sure some of the info changed!). Maggie said the ride was too slow (maybe we shouldn't have done Test Track first?) and she was tempted to get out and walk. I think all the signs saying NOT to get out and walk were what gave her the idea. Awards night had SO many twirlers!! I keep almost saying girls, but there were also events in the mens' division, as well as events with both male and female competitors. But it was mostly girls. While we had gotten placements on individual events earlier, awards night was for the big pageant reveals, where placements were based on a composite of the scores of multiple events. 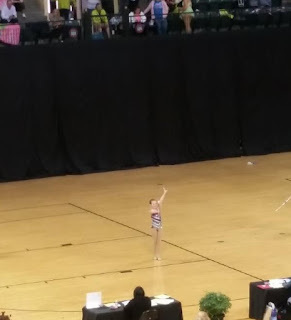 Out of 35 or so in her group, Maggie placed 9th in the pageant for her age and level!! That meant a glorious trip to the podium for her, but my camera had given up hours earlier. I'm so proud of all the work she put in to compete at this international competition. Besides her 9th place medal for her pageant, she also got a 7th place medal for her x-strut, and earned 11th place for her advanced march and military march. Sadly enough, I would have sworn I posted on Facebook with all of her placements, but I absolutely cannot find it now. Anyway, we had a GREAT trip and would love to go back to enjoy more of what the parks have to offer. It was a frantic trip, and we frequently felt like we were trying to do too many things at once. The competition pretty much encouraged this, as park tickets were a requirement with registration, since EWWW technically required a park ticket as well. We had four-day park hopper tickets, but only spent an hour at Hollywood Studios and a short evening at Animal Kingdom. While we made it to Magic Kingdom twice, the parade day wasn't really to 'enjoy' the park. I look forward to taking both Maggie and her brother to the parks to just experience the parks and the kids' enjoyment of them. WOW!! Like the parks don’t have enough to offer. I agree another trip with the little and just parks. You were crazy busy and you still had your drive home!! Test Track is one of my favorite rides in general ... lots of fun. "EWWW" cracked me up, also :).